Apple barbecue wood produces a light sweet fruity smoke. Apple wood is great for pork, poultry, and fish. This is one of our favorite woods to use for ribs. Apple BBQ smoking wood is available in Apple chips and Apple chunks. Alder creates a milder sweet delicate smoke best suited for situations where just a hint of smoky flavor is desired. Alder is best used for fish, vegetable poultry, game birds and pork. Traditionally Alder wood is used to smoke Salmon. 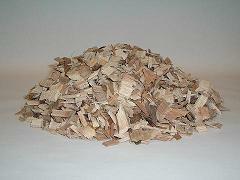 Alder BBQ wood is available in Alder chips and Alder chunks. Cherry BBQ smoking wood is the go to wood. You can use Cherry wood to smoke just about anything. Cherry BBQ wood offers you, the best sweet flavor smoke. We particularly like using cherry wood for our chicken. Cherry wood also gives your meats a darker color which in our opinion enhances the presentation. Cherry BBQ wood is available in Cherry chips and Cherry chunks. Hickory BBQ smoking wood has a intense flavor. Hickory is the most used and popular of all smoking woods. But some find the flavor overpowering. Hickory wood can be used when smoking red meat, brisket, chicken and pork. Hickory BBQ wood is available in Hickory chips and Hickory chunks. The use of Mesquite smoking wood is a ritual in Texas. Mesquite wood produces a very heavy smoke that is distinct and somewhat sweet. Mesquite wood will add a lot of flavor which some people feel is overpowering. Mesquite smoking wood is used for beef, pork, poultry and fish. Mesquite BBQ wood is available in Mesquite chips and Mesquite chunks. Maple smoking wood produces a lovely mellow or mild sweet taste. Maples BBQ smoking wood is best used with vegetables, poultry or pork. Maple BBQ wood is available in Maple chips and Maple chunks. Oak smoking wood is another "go to wood". Oak smoking wood can be used with just about any type of meat. Oak wood offer a medium smoke flavor that will not overpower meats. Oak smoking wood is used most commonly with beef, lamb, ribs, and chicken. Oak BBQ wood is available in Oak chips and Oak chunks. Pecan wood produces a mellow rich smoke which is similar to hickory but milder. Pecan works great with chicken, fish, and ribs. If you like the taste of hickory smoke but find it to overpowering this is the wood for you. Pecan BBQ wood is available in Pecan chips and Pecan chunks. We never add or spray anything on to our wood. All of our wood is kiln dried and then is store indoors to ensure that you receive that best quality of wood that is available on the market today. We are very simple people we know with the best smoking wood, best service, and best price, why would you go anyplace else? We look forward to serving you.